Living a Fit and Full Life: Eat Healthier with the New Chopped Caesar Salad Kit from Dole! Eat Healthier with the New Chopped Caesar Salad Kit from Dole! Our Chopped Caesar Salad Kit allows salad lovers to enjoy a restaurant-inspired salad at home. 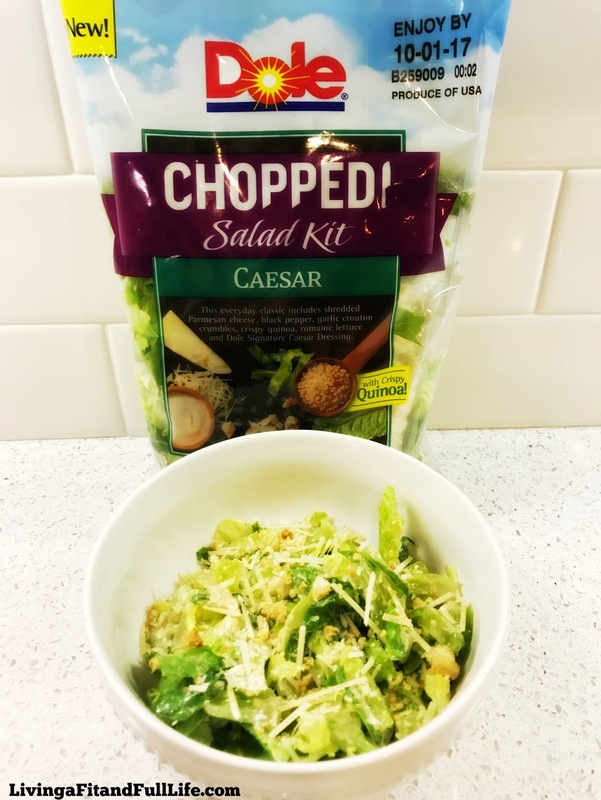 With chopped romaine lettuce, crunchy garlic crouton crumbles, crispy quinoa, as well as shredded Parmesan cheese, black pepper and DOLE®’s Signature Caesar Dressing, this salad is both nutritious and delicious. This everyday classic includes shredded Parmesan cheese, black pepper, garlic crouton crumbles, crispy quinoa, romaine lettuce and Dole Signature Caesar Dressing. Eat healthier with the new Chopped Caesar Salad Kit from Dole! As a mom of 4 I'm always looking for ways to get my family to eat healthier. I'm also a runner and know how important fueling my body with healthy foods is. When I eat healthy I feel better, run better and can be a good example to others. With my kids being a good example when it come to eating healthy is so important. If you're kids don't like to eat anything healthy, I highly suggest you take a look at your eating habits and make sure your kids see you eating healthy because for me and my kids, that's all it takes. I often eat salads for lunch and when I tell my kids we're having salad for lunch, they literally all scream "yay". One thing I've noticed with my younger kids that are 2 and 4 is that while they like salads, sometimes they get a piece that's too big and then they don't really want to eat anymore. With the new Chopped Caesar Salad Kit from Dole the salad is chopped into very small pieces that are perfect for kids. I also prefer the smaller chopped pieces as they're much easier to eat. And, since it comes in a kit, there's minimal work for me to do to get it on the table making it perfect for lunch or dinner. I also really like that Dole's new Chopped Caesar Salad Kit contains crispy quinoa, cheese, croutons and black pepper to add even more flavor to your salad. The Caesar dressing is delicious and the salad was extremely crispy and fresh just like a good salad should be! The new Chopped Caesar Salad Kit from Dole is the perfect way to eat healthier that the whole family will enjoy! Click HERE to find a store near you that sells Dole! Click HERE to learn more about Dole! Follow Dole on social media!